PVC-ALU window Optimo CLIPP is a highly resistant window offering all advantages of modern windows. It meets all today’s expectations about the quality. 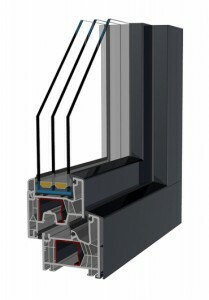 PVC-ALU window frames Optimo CLIPP have an innovative design with three EPDM gaskets guaranteeing airtight installation, while aluminium cladding withstands all weather conditions. 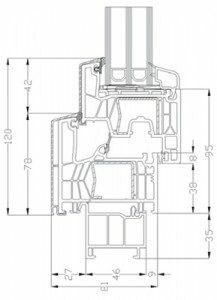 Beside great insulation, this narrow profile also features exceptional static and other technical properties, which are otherwise expected with large-sized window frames. Replacing old windows with modern windows Optimo CLIPP is fast, simple, and clean if it is carried out by qualified and experienced installers. You can design profiles in line with your aesthetic preferences; you can choose the indoor and outdoor colors of your PVC profiles with decorative foil or varnish, as well as other accessories for PVC windows. PVC-ALU windows Optimo CLIPP of the line OPTIMO are also available in the PVC version without aluminium cladding, namely with the profile Optimo.